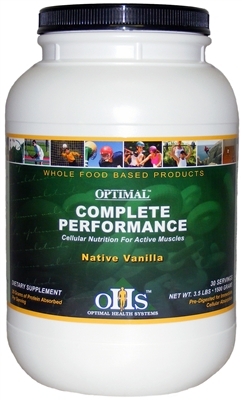 WITH 20 GRAMS OF HIGHLY DIGESTIBLE PROTEIN PER SERVING, Optimal Health Systems has teamed up with one of the top flavoring houses in the world and the end result is the launch of the newest product in the Optimal Health Systems product line: Complete Performance. The goal was to create a high-protein formula utilizing nutrient-dense quality ingredients, but with a taste comparable to the high-sugar "junk" protein drinks on the market. After repeated taste trials the ultimate goal was reached: real nutrition with great taste. Complete Performance utilizes the most nutrient dense forms of proteins, carbohydrates and fats available. This ensures that your body will have the nutrients needed to restore energy and help create lean calorie-burning muscle. Most formulas on the market contain proteins that are poorly-digested and of little benefit to the body. Moreover, the carbohydrate source is usually from maltodextrin, which has zero nutrient value. And, as if that isn't bad enough, the fat source from these inferior products is from hydrogenated fats which research clearly demonstrates are disease-causing "bad" fats. Complete Performance, on the other hand, utilizes nutrient-rich carbohydrates from vegetables, cold processed oils for fat, and the most revolutionary protein complex available. The second principle is to ensure that the protein is actually broken down and absorbed by the body. This starts with picking proteins that can be broken down easily in the body. Moreover, the proteins selected must not remove energy from the body while they are being assimilated. Optimal Health Systems created the first true "digestion delivery system" almost two decades ago. We have now perfected the specific blend of pure plant enzymes and minerals to ensure complete break-down of the protein along with the carbohydrates and fats in the formula. This guarantees that no fat is stored in the body. Instead, the only nutrients delivered to the cells will enhance the body, create energy, and help the body recover efficiently from the stress of exercising. Other Ingredients: Soy protein isolates, dextrose, cocoa powder, white chocolate powder, xylitol, natural and artificial chocolate flavor, whey protein isolate, sunflower oil powder, MCT oil powder, milk protein isolate, canola oil powder, stabilized glutamine (MGG), Sucralose and bovine colostrums.